Let me introduce you to a new, illustrated story Bible, sweetly written by Doris Rikkers, and colorfully illustrated by Fernando Juarez. Before you start thinking, "Oh, its just another Bible storybook for children," let me tell you what's unique about this one. 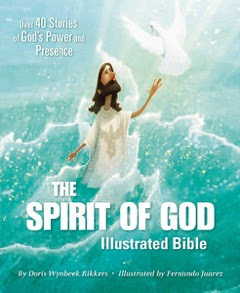 The Spirit of God Illustrated Bible uses over 40 short stories, presented in a way that helps readers understand how God’s Spirit has been with us since the beginning of time and continues to be with us today. The book starts out with the account of Creation, where it says in Genesis 1:2, "Now the earth was formless and empty, darkness was over the surface of the deep, and the Spirit of God was hovering over the waters." (NIV) From there, we are taken through many of the accounts in the Old Testament - some of which will be new stories to the children (and even the adults) who read them. Then, after the building of the temple in Jerusalem is completed, we are taken into the New Testament where we are taught about the life of Christ, and the birth of the church. 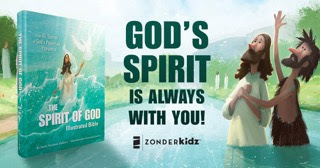 In my opinion, this storybook is a unique way of presenting the Bible to children of all ages, while also being appealing (and educational) for adults. GIVEAWAY: I am happy to be able to give away a copy of this bible to one of my readers. If you are interested, you will need to do ONE of two things - either make a comment on this blog post and make sure I have a contact e-mail for you, or make a comment on the Facebook post on HHMRH MINISTRIES PAGE where I will contact you via private message if you are the winner. For all those who comment, a random drawing will be held on Saturday, September 22, 2018, at 8:00 p.m. Central Time. Many thanks to Propeller Consulting, LLC for providing this prize for the giveaway. Choice of winners and opinions are 100% my own and NOT influenced by monetary compensation. I did receive a sample of the product in exchange for this review and post. Only one entrant per mailing address, per giveaway. If you have won a prize from our sponsor Propeller/FlyBy Promotions in the last 30 days on the same blog, you are not eligible to win. Or if you have won the same prize on another blog, you are not eligible to win it again. Winner is subject to eligibility verification. Thanks for commenting, Karen. You didn't win this time, but please try again another time!